Amtrak is a federally owned railroad which provides national passenger train service in the United States. Amtrak was created in 1971 to relieve most railroads from being required to continue to provide passenger service. In return, the railroads agreed to allow Amtrak to use its tracks. 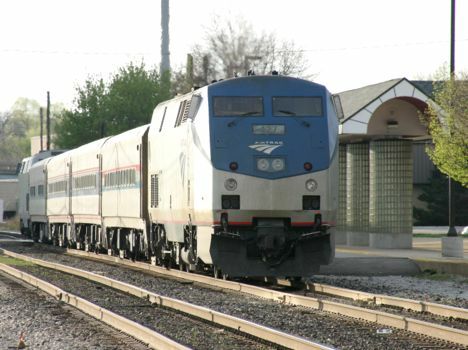 In Michigan, Amtrak provides passenger service on three lines. It operates three round trips each day between Pontiac via Detroit to Chicago, Illinois (CN/Conrail/Amtrak/NS). The second route has a single round trip each day between Port Huron and Chicago, via Battle Creek (CN/Amtrak/NS). The third route has a single round trip each day between Grand Rapids and Chicago via Porter, Indiana (CSX/NS). Amtrak operates on two sections of track which are not owned by freight railroads. Amtrak itself purchased former Conrail trackage between Kalamazoo and Porter, Indiana. In 2013, the State of Michigan purchased former Norfolk Southern trackage between Dearborn and Kalamazoo. The first line offered trains that exceed 80 m.p.h. in a section which uses advanced positive train control. High speed operation is also planned for the Dearborn to Kalamazoo route as well. Norfolk Southern continues to provide freight service on both of these lines through trackage rights. Amtrak has stations in Albion, Ann Arbor, Battle Creek, Benton Harbor/St. Joseph, Birmingham, Dearborn, Detroit, Dowagiac, Durand, Flint, Grand Rapids, Holland, Jackson, Kalamazoo, Lansing, Lapeer, Michigan City, Niles, and Pontiac in Michigan.